"InstantLogonChanger is a small, simple, free tool that lets you use any image or solid color as your log-on screen background without requiring special privileges or badgering you with security prompts." 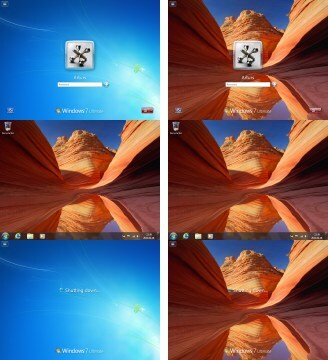 With InstantLogonChanger always have your Windows 7 logon background the same as your Desktop wallpaper! Just install InstantLogonChanger and you're done! 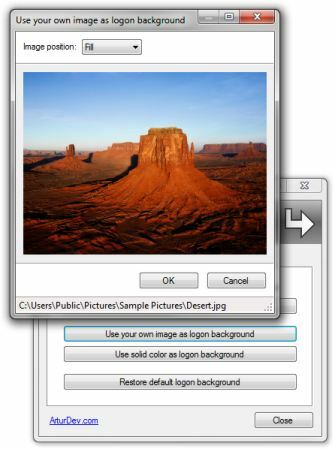 Or use any other image as a logon background. JPEG, PNG, BMP, GIF, or TIFF image formats are supported. You can fill, fit, stretch, tile, or center your image and even change background color for images that are too small to fit the screen. 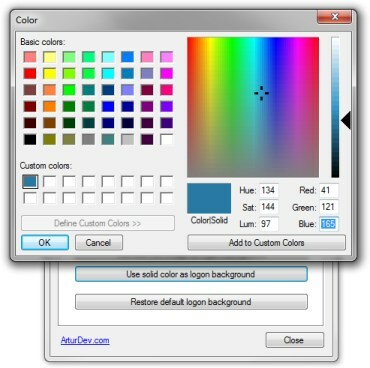 You can also use any color as a logon background. Made with a business user in mind, InstantLogonChanger allows you to disable all of it's notifications, such as update alerts, to not disturb while you're giving an important presentation. 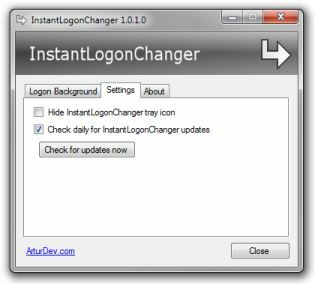 Just enable Hide InstantLogonChanger tray icon setting. 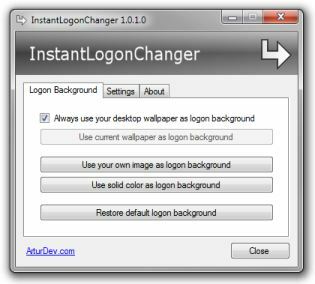 You can always go back and change what to use as your Windows logon background by opening InstantLogonChanger from either Start menu, or by double-clicking it's tray icon. InstantLogonChanger also automatically adjusts logon screen text and button color so they're better visible no matter what image is used as a logon background. And all that without annoying security prompts or changing any system files! Have any questions, suggestions, or bug reports? Just send an e-mail.